This piece originally appeared in The Conversation. It appears here under a Creative Commons license. [In May of this year] the U.S. National Academies of Sciences, Engineering, and Medicine released a review of 20 years of data regarding GE crops. The report largely confirms findings from previous National Academies reports and reviews produced by other major scientific organizations around the world, including the World Health Organization and the European Commission. I direct a laboratory that studies rice, a staple food crop for half the world’s people. Researchers in my lab are identifying genes that control tolerance to environmental stress and resistance to disease. We use genetic engineering and other genetic methods to understand gene function. I strongly agree with the NAS report that each crop, whether bred conventionally or developed through genetic engineering, should be evaluated on a case-by-case basis. Every crop is different, each trait is different and the needs of each farmer are different too. More progress in crop improvement can be made by using both conventional breeding and genetic engineering than using either approach alone. 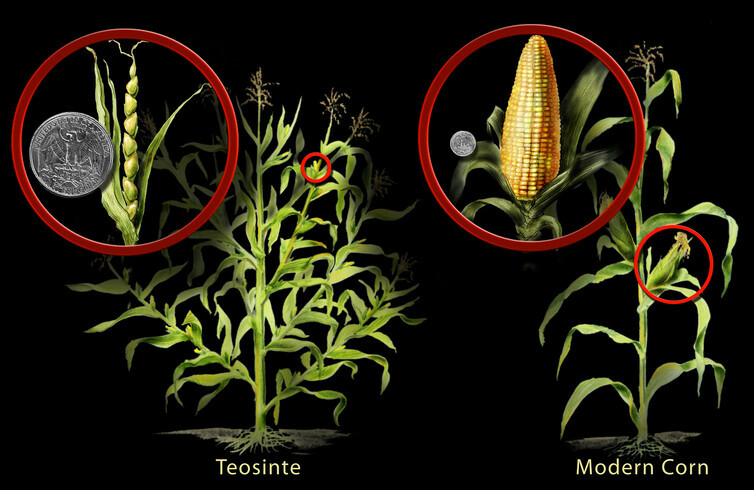 Modern cultivated corn was domesticated from teosinte, an ancient grass, over more than 6,000 years through conventional breeding. New molecular tools are blurring the distinction between genetic improvements made with conventional breeding and those made with modern genetic methods. One example is marker assisted breeding, in which geneticists identify genes or chromosomal regions associated with traits desired by farmers and/or consumers. Researchers then look for particular markers (patterns) in a plant’s DNA that are associated with these genes. Using these genetic markers, they can efficiently identify plants carrying the desired genetic fingerprints and eliminate plants with undesirable genetics. Ten years ago my collaborators and I isolated a gene, called Sub1, that controls tolerance to flooding. Million of rice farmers in South and Southeast Asia grow rice in flood prone regions, so this trait is extremely valuable. Most varieties of rice will die after three days of complete submergence but plants with the Sub1 gene can withstand two weeks of complete submergence. Last year, nearly five million farmers grew Sub1 rice varieties developed by my collaborators at the International Rice Research Institute using marker assisted breeding. In another example, researchers identified genetic variants that are associated with hornlessness (referred to as “polled”) in cattle – a trait that is common in beef breeds but rare in dairy breeds. Farmers routinely dehorn dairy cattle to protect their handlers and prevent the animals from harming each other. Because this process is painful and frightening for the animals, veterinary experts have called for research into alternative options. In a study published last month, scientists used genome editing and reproductive cloning to produce dairy cows that carried a naturally occurring mutation for hornlessness. This approach has the potential to improve the welfare of millions of cattle each year. In assessing how GE crops affect crop productivity, human health and the environment, the NAS study primarily focused on two traits that have been engineered into plants: resistance to insect pests and tolerance of herbicides. The study found that farmers who planted crops engineered to contain the insect-resistant trait – based on genes from the bacterium Bacillus thuringiensis, or Bt – generally experienced fewer losses and applied fewer chemical insecticide sprays than farmers who planted non-Bt varieties. It also concluded that farms where Bt crops were planted had more insect biodiversity than farms where growers used broad-spectrum insecticides on conventional crops. 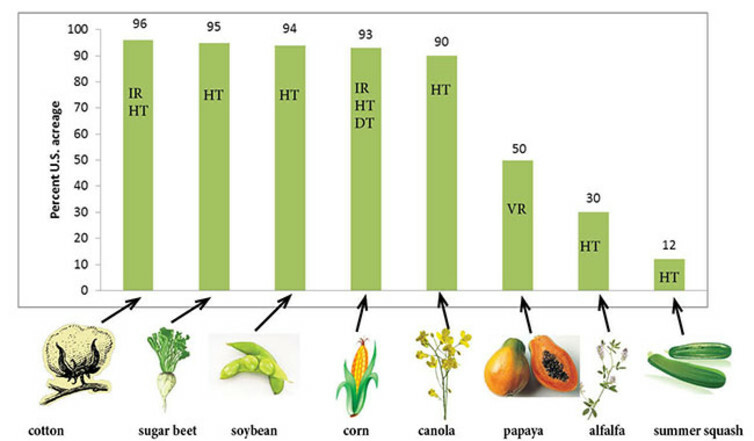 Genetically modified crops currently grown in the United States (IR=insect resistant, HT=herbicide tolerant, DT=drought tolerant, VR=virus resistant). The committee found that herbicide-resistant (HR) crops contribute to greater yields because weeds can be controlled more easily. For example, farmers that planted HR canola reaped greater yields and returns, which led to wide adoption of this crop variety. Another benefit of planting of HR crops is reduced tillage – the process of turning the soil. Before planting, farmers must kill the weeds in their fields. Before the advent of herbicides and HR crops, farmers controlled weeds by tilling. However, tilling causes erosion and runoff, and requires energy to fuel the tractors. Many farmers prefer reduced tillage practices because they enhance sustainable management. With HR crops, farmers can control weeds effectively without tilling. The committee noted a clear association between the planting of HR crops and reduced-till agricultural practices over the last two decades. However, it is unclear if the adoption of HR crops resulted in decisions by farmers to use conservation tillage, or if farmers who were using conservation tillage adopted HR crops more readily. In areas where planting of HR crops led to heavy reliance on the herbicide glyphosate, some weeds evolved resistance to the herbicide, making it difficult for farmers to control weeds using this herbicide. The NAS report concluded that sustainable use of Bt and HR crops will require use of integrated pest management strategies. The report also discusses seven other GE food crops grown in 2015, including apple (Malus domestica), canola (Brassica napus), sugar beet (Beta vulgaris), papaya (Carica papaya), potato, squash (Cucurbita pepo) and eggplant (Solanum melongena). Papaya is a particularly important example. In the 1950s, papaya ringspot virus wiped out nearly all papaya production on the Hawaiian island of Oahu. As the virus spread to other islands, many farmers feared that it would wipe out the Hawaiian papaya crop. 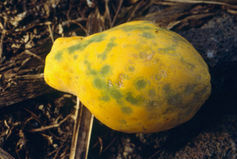 Papaya infected with ringspot virus. In 1998 Hawaiian plant pathologist Dennis Gonsalves used genetic engineering to splice a small snippet of ringspot virus DNA into the papaya genome. The resulting genetically engineered papaya trees were immune to infection and produced 10-20 fold more fruit than infected crops. Dennis’ pioneering work rescued the papaya industry. Twenty years later, this is still the only method for controlling papaya ringspot virus. Today, despite protests by some consumers, 80 percent of the Hawaiian papaya crop is genetically engineered. Scientists have also used genetic engineering to combat a pest called the fruit and shoot borer, which preys on eggplant in Asia. Farmers in Bangladesh often spray insecticides every 2-3 days, and sometimes as often as twice daily, to control it. The World Health Organization estimates that some three million cases of pesticide poisoning and over than 250,000 deaths occur worldwide every year. To reduce chemical sprays on eggplant, scientists at Cornell University and in Bangladesh engineered Bt into the eggplant genome. Bt brinjal (eggplant) was introduced in Bangladesh in 2013. Last year 108 Bangladeshi farmers grew it and were able to drastically reduce insecticides sprays. Genetically improved crops have benefited many farmers, but it is clear that genetic improvement alone cannot address the wide variety of complex challenges that farmers face. Ecologically based farming approaches as well as infrastructure and appropriate policies are also needed. Instead of worrying about the genes in our food, we need to focus on ways to help families, farmers and rural communities thrive. We must be sure that everyone can afford the food and we must minimize environmental degradation. I hope that the NAS report can help move the discussions beyond distracting pro/con arguments about GE crops and refocus them on using every appropriate technology to feed the world in an ecologically based manner.